So yeah, a pirate needs a flag. 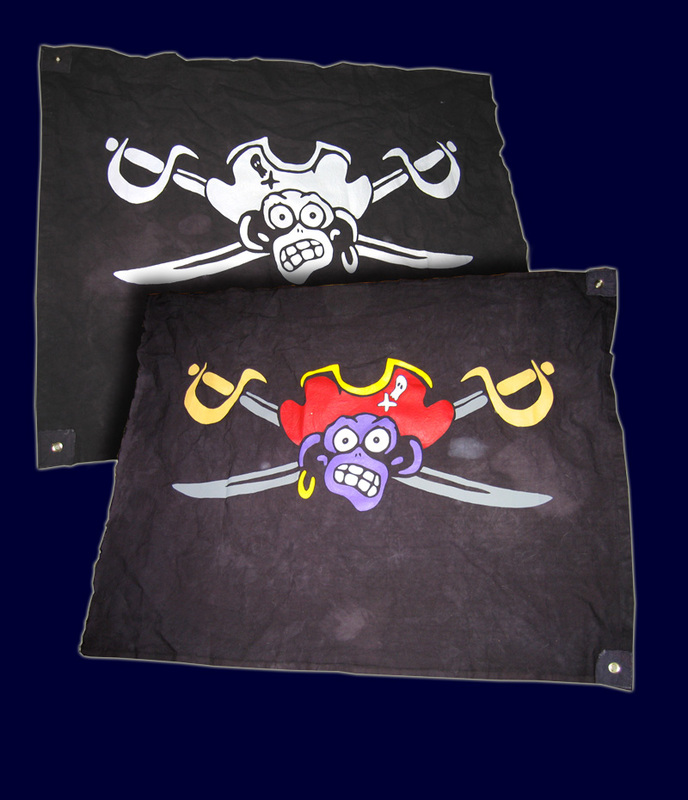 And while many pirates opt to buy the first cheapo jolly roger they can get their hands on, TRUE pirates will design their own (or force a talented hostage to design it for them.) But then the question begs; how to apply the glorious design to an actual flag? Worry not, that’s what experts such as Dirk and Arrow are for – they’ll make your flag, thus freeing you to practice your shooting, your stabbing, your wenching, and all the rest of it. When my Dirk and Arrow flag arrived, the first thing I noticed was its weight – this is some relatively heavy-duty canvas – not exactly tent material, but heftier than the sissy nylon you might be accostomed to. While remaining lightweight enough to flap in the breeze (and therefore strike fear into the hearts of your victims), it’s still a sturdy, robust flag that should last you more than a few voyages. Adding to this quality are the brass grommets, carefully affixed to additional patches of material to prevent ripping, should you be foolish enough to navigate your way into a gale. I’m very happy with my Dirk and Arrow flag – it’s beautiful, durable, and suitable for land or sea invasions. Whether you want a single or multi-color flag (or a mix of both – see their website for some great examples of flags that utilize just a “splash” of color), they can surely provide a standard of which you’ll be proud to hoist. This entry was posted in Other and tagged bilgemunky's favorites, custom work, dirk and arrow by Bilgemunky. Bookmark the permalink.